Devabulator is a widget written for Konfabulator / Yahoo! Widgets. 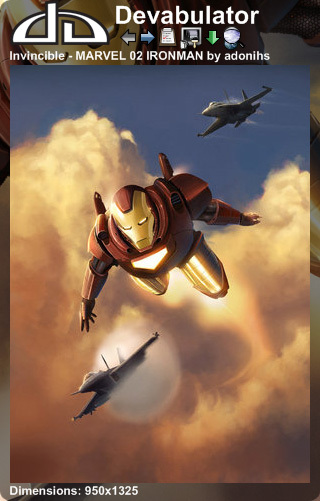 Devabulator brings the best digital art, wallpaper, paintings, photographs, literature etc. from deviantART to your desktop. Choose the category you want to view, enter a few search modifiers if you feel like it and Devabulator will cycle through the deviations automatically. Art worthy of your desktop? Use Devabulator to manage your desktop wallpaper too. View deviations in any deviantART category - offsets within each category are saved, so you can resume where you left off. Customize the deviation slideshow using deviantART's powerful search and filter capabilities. Set your desktop wallpaper directly from Devabulator. Besides the automatic slideshow, you can force a switch to the next or previous deviation by using the arrows or pressing 'n' or 'p'. 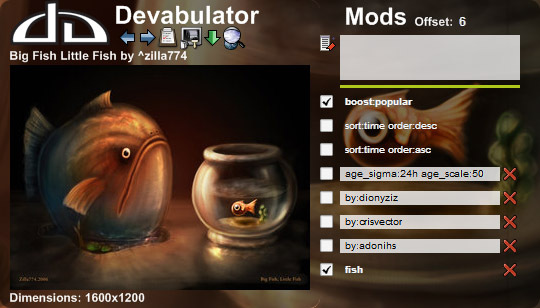 This version of Devabulator is fully compatible with deviantART version 5 and uses a brand new engine which leverages new deviantART capabilities. As a result, this version is faster, less error prone and extended deviation info missing from the last version is now available. A few major bugs with the wallpaper feature were fixed along with some stability issues. Note: Devabulator is not an official deviantART widget. Devabulator.widget (832 kB) Flat Widget file which only works with YWE 3.1 and up (recommended). Devabulator.widget (591 kB) Older format which works with YWE 3.0 and up. Devabulator is also hosted on the Yahoo Widget Gallery and on deviantART. Download and install Konfabulator. If you already have Konfabulator installed, move on to step 2. Download the current version of Devabulator. Copy the Devabulator.widget file into your widget folder (optional). Double click the Devabulator.widget file or Open it with Konfabulator to get it up and running. Click to move to the previous deviation. Click to move to the next deviation. Click to select your category. The menu closes when you make a selection or if you click the button again. Click to set the current deviation as your wallpaper. Click to download the current deviation. Devabulator will prompt you for the download location if the corresponding preference is not set. Click to open and close the mod pane, see the section below for more details on the mod pane. Right click the widget and choose Widget Preferences for more options, each preference is self explanatory and has a description attached. deviantART version 5 introduced a powerful searching, filtering and sorting capability which you use to fine tune the deviations shown in Devabulator. To add a modifier, simply use the mod button to open the modifier pane. Type the modifier into the textarea and select Add modifier to add your modifier to the list. Once the modifier has been added to the list, use the checkbox to activate it - modifiers in the list are not part of the search unless explicitly activated. If you wish to deactivate a modifier, simply uncheck it. You may also remove it permanently by clicking the delete button . To edit a modifier, first deactivate it (if activated) and then simply edit it in place. -by:infernalproteus: Deviations by everyone but infernalproteus. (by:infernalproteus or by:dionyziz): Deviations by infernalproteus or dionyziz. 1920x1200: Deviations with dimensions equal to 1920x1200. spiderman: Deviations which match the search term "spiderman". -spiderman: Deviations which do not match the search term "spiderman". max_age:24h: Deviations not older than 24 hours. min_age:24h: Deviations at least 24 hours old. in:digitalart: Deviations from the Digital Art category. boost:popular: Popular deviations are appear higher in the result list. sort:time order:desc: Sort deviations by descending order of time (Newest first). sort:time order:asc: Sort deviations by ascending order of time (Oldest first). age_sigma:24h age_scale:50: Deviations in last 24 hours are more likely to come out on top. More than one modifier can be active at a single time; however, some are mutually exclusive. deviantART will AND modifiers unless otherwise specified. For example, if you with to see deviations by adonihs or crisvector, you must add a modifier (by:adonihs or by:crisvector). Activating two independent by modifiers for the above deviants will yield no results. Devabulator comes pre-installed with 7 sample modifiers, the first 3 of which are mutually exclusive and cannot be deleted - they correspond to Popular, Newest First and Oldest First sort orders respectively. Note: Please be advised that the category selection affects the list of deviations returned. Activating a by:infernalproteus modifier while you are in the Digital Art category will show you deviations by infernalproteus in that category only. Deviations from other categories will not be returned. If you wish to use a category free search, make sure you choose All Deviations from the category menu. More information about deviantART's search capabilities can be found here. Devabulator relies on deviantART to function, if deviantART is down or sluggish, Devabulator will be affected. Normally, new deviations might not appear in Devabulator for upto 30 minutes. This is because of the lag between deviation submission and search engine indexing. Category hierarchy displayed may differ from the hierarchy at deviantART. This means that deviantART may display categories that are not present in Devabulator or vice versa. Below, I describe a method which will re-cache the categories list - I will make this more convenient in a future release. Switch Konfabulator to debug mode. To do this, hold down the control and shift keys and select the Gear menu in the system tray (Windows) or the menu bar (Mac). The context menu which shows up will have a "Debug Mode" option. In the debug window that shows up, type "refreshCategories()" wait a minute or two while Devabulator fetches a fresh category list from deviantART. After it's done, restart Devabulator. Turn off debug mode so that the debug window does not stay open. You may perform the above steps repeatedly. If you want to switch back to the internal categories file, type in "deleteExternalCategories();" in the debug console. Dionysis has been instrumental in getting Devabulator working with deviantART's search API. Without his suggestions and assistance, I would probably have abandoned the project. I'm Brian Fernandes and you can send me feature requests, bug reports and any other comments you may have. Feedback is encouraged; many features in this version have been requested by users. If you're happy with Devabulator, I'd love to hear from you.